Straight From Confreda Greenhouses and Farm in Cranston... Picked That Same Day! Perfect for a light and satisfying lunch. Packed with nutrition and most importantly, flavor! 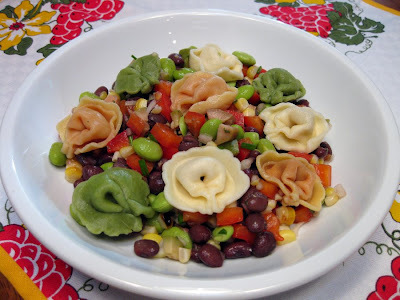 Topped Off With Some Tri-Color Torellini~ Makes A Great Hearty Dinner! This recipe was inspired by my local Stop & Shop market. I often see an Edamame Salad in the prepared food case in the deli section. It caught my eye because it is so colorful. It was pretty easy to deconstruct and make my own with some special touches. I love making salads like this in the summer. And this one is refreshing and light, yet really is packed with nutritious ingredients. Plus, who can resist fresh sweet corn in the summer? Well there's no need to resist, since it is a good choice in any healthy diet. According to the World's Healthiest Foods Website, corn is a good source of vitamin B1, vitamin B5, folate, dietary fiber, vitamin C, phosphorus and manganese. It is especially good for cardiovascular health due to the great source of folate it supplies. The edamame (soy beans) are also super healthy to eat. They are a great source of protein and contain loads of healthy fats. The red bell pepper contains a huge amount of vitamin C and the black beans add more protein and of course, fiber. This salad can be served as a light lunch, a side dish with grilled chicken or fish, or served with pasta as a main course entree. Heat a gas grill to medium-high, light a charcoal fire or place indoor stovetop grill over medium high heat. 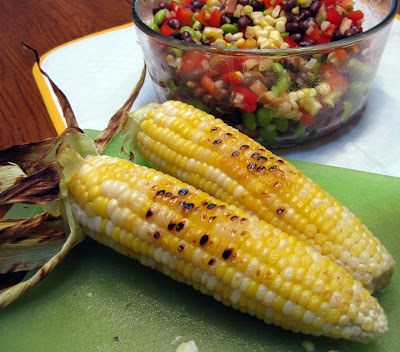 Place corn directly on grill and cook for around 15 minutes, rolling corn occasionally so all sides get grill marks. Set aside until cool enough to handle, about 10 minutes. Pull off charred husks and discard. Stand each ear on its wide end, and using a serrated knife, remove grilled corn kernels from cobs. Add kernels to a large bowl. Add all remaining ingredients to bowl and mix well. Refrigerate for at least 30 minutes to let flavors meld together. Serve at room temperature. This salad looks so beautiful,colorful and healthy I guess I will have to eat some,bambola. What a gorgeous salad! It looks beautiful and healthy. I know i would like it for sure. Great salad. I like that you added the edamame for protein. That makes it a one dish meal. Super! One more word...this would be a PERFECT salad to take to a picnic when you're not sure if there will be any vegetarian protein available. Beautiful salad! Refreshing and yet hearty at the same time - exactly what I want for dinner in the summer! 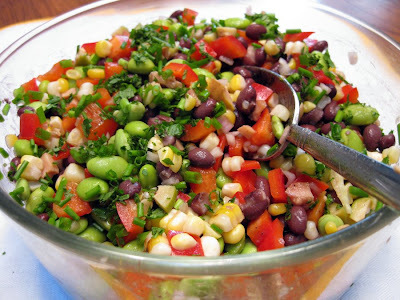 Lovely salad...like the colors in it...edamame and corn such a great combination! These all look delicious! I think the best part of summer salads are how bright and colorful they are. love the addition of edamame!